All systems ready for launch sequence. has been brought to a happy conclusion after much due diligence. I, as were a few others, was somewhat surprised at the selection of Torqeedo, made in Germany. Even though I was the main decider, there was a bit of history, support issues, technical information and pricing. The bottom line, pricing, was dealt with by actually paying more than the Torqeedo competitors. The Torqeedo Cruise 2.0 RL is not a cheap build, it is fully EU compliant with a host of firsts. Not only a first rate motor but an entire systems approach has been launched that can knit two units together with a single binnacle having GPS speed, health, charge level, distance and time remaining. The first edition of this boat had only two 5 hp electric motors that yielded enough power to push the boat at the hull speed of seven knots. Just one of those motors weighed more than all three of these. The three shown provide 18 hp, That is 8 hp more than needed for hull speed. Actual power trials and maneuvering will commence about the last week of June 2017. To compliment that technology is their unique optional battery pack with seamless integration. Even though I will not be using all of that tech by using my own flooded cell lead acid batteries, I can still use a great deal of the tech with a future option to add on their Li battery system at any time... plug and play. 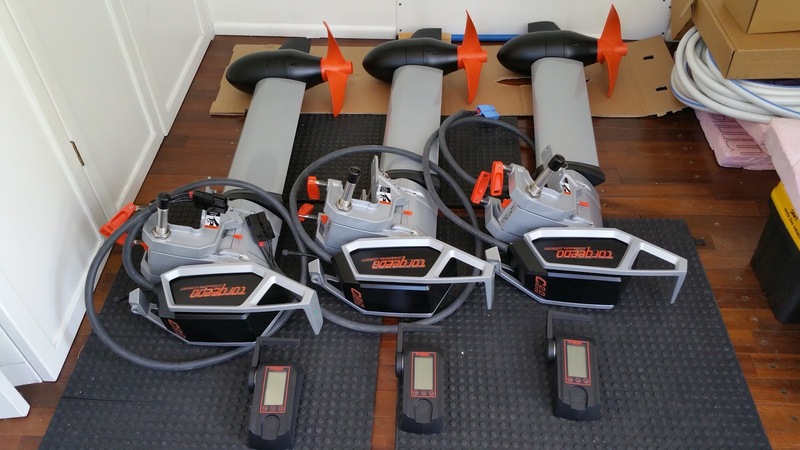 The purchase was for 3 of the motors, 3 spare propellers, 6 extensions for the forty foot boat and three individual speed/direction controllers. 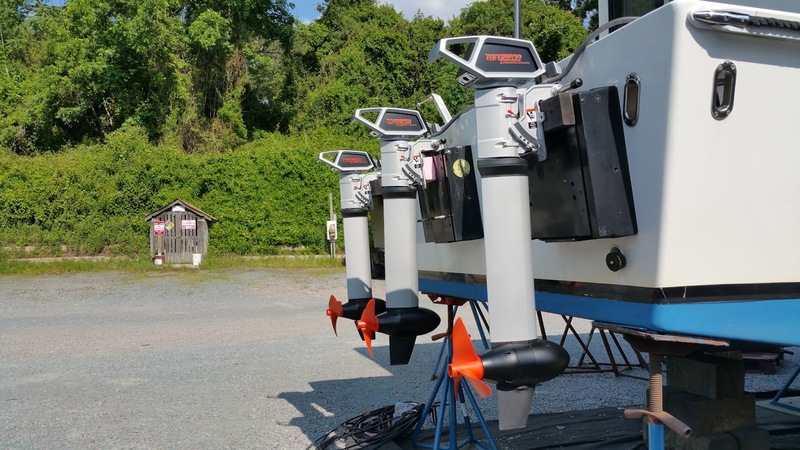 The three diminutive motor's size belies the power that is packed into a submerged 24 volt power torpedo mounting an advanced propeller of a whopping 12' diameter. That diameter is 2 inches more than the powerful custom conversion outboards I have made for the boat. In fact they are as big and more power efficient than the original 12" Michigan Wheel props originally selected for the first version of the MOG. Gone is the 60 hp gasoline engine and 2 large electric outboards. Can you spot the electric motors peaking over the transom? The clutter of two gasoline tanks, gas hoses, starter cable, shift cable and throttle is gone. The testing will begin in late June after the relaunch. All of the cabling and switches were also a part of the Torqeedo package, saving many hours of creating custom cables and affixing terminals of correct size to the ends, a thankless task. What is even more fun is that even at forty feet of boat, it all fits as if a 12 foot boat. Because of the boat length of nearly 40 feet, I added 6 extra helm controller cables to the order, that was it. This is where the electricity hits the water. The motors I had custom built were lighter than any on the market, powered by only 24 volts but at significant amperage. The same 24 volts was key to be kept and the new motors function from the same low voltage system used previously. To say the least, Torqeedo has made the setting up quite easy. 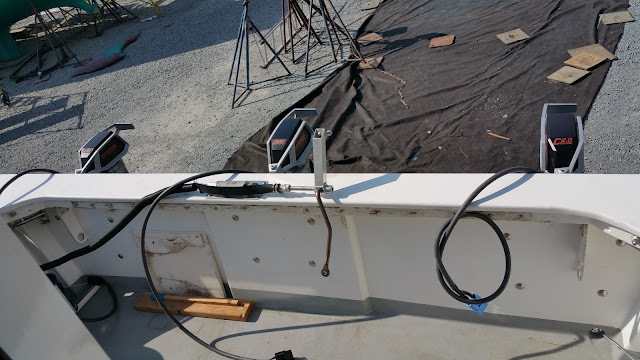 At a final weight (including the heavy duty twin 5 foot copper wire) of just 42 pounds, lifting them onto the transom was easy. Stowed on the aft salon sole are the 3 motors, very powerful and compact, with remote hand controls. All three motors can therefore be set into position, powered and ready for throttle in less time than a coffee break. No huffing and puffing required. Getting a few snapshots of the transom decked out in its new garb was nearly effortless on a very warm day, an absolutely grand exercise. More about which to write in a few weeks but this should get you up to speed with what is in the works.